From 'They're Digging up my School Today' to 'The Giant African Land Snail's Rap', this book is full of brilliant scripts and poems to get children aged 7 to 11 confidently rhyming, moving and imagining. Let's Perform! offers fresh, fun material from Cath Howe, an experienced dra... read full description below. From 'They're Digging up my School Today' to 'The Giant African Land Snail's Rap', this book is full of brilliant scripts and poems to get children aged 7 to 11 confidently rhyming, moving and imagining. Let's Perform! offers fresh, fun material from Cath Howe, an experienced drama practitioner, for literacy lessons, drama classes, assemblies, after school and drama clubs. A child's lack of engagement in speaking and listening tasks can reveal wider issues of self-esteem. Cath has included everyday dilemmas as well as surreal scenarios, ranging from funny and ridiculous to serious and emotional, to inspire all children. 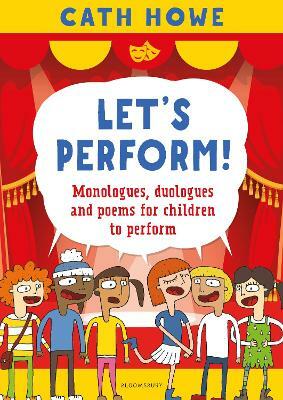 Perfect for encouraging creative writing and public speaking, each monologue, duologue or performance poem is accompanied by easy-to-follow performance tips and activities that can also be used in cross-curricular subjects. Additional creative activities for the book are also available online. This vibrant collection is a must-have text to set every child's imagination whirring. Cath Howe is an author and teacher with a real passion for writing and creativity. She has been working at Fern Hill for over ten years as a `Writer in Residence', running workshops on everything to do with writing and performing. She now visits other schools as an author and workshop leader, while also developing her `Writer in Residence' role at Kingston University, UK.